One of the most common causes of acne breakouts is the buildup of oil and other gunk within your pores. When your pores become clogged like this they tend to collect bacteria and bacteria leads to the development of acne. This is why it’s so important to not only wash your face but use something that penetrates deep into follicles to get rid of dirt and grime that resides there. Skipping this step will lead to more breakouts and your skin will never be properly balanced enough to be completely clear. This is why products such as Dermalogica Overnight Clearing Gel were created. Below we’re going to review this unique skin purifying treatment in full detail. Dermalogica is a company that offers many high-end, extremely effective cosmetics. They make everything from simple cleansers to skin brighteners and beyond. The products they are best known for, however, are the ones in their acne treatment lines. The Overnight Clearing Gel is part of their mediBac adult acne clearing product line. This simple gel is designed to be left on overnight and it helps to clear up pores, kill bacteria, and prevent future acne flareups. The gel also works to control the amount of oil your skin produces and calm irritated skin affected by acne. The product can be used as either a targeted spot treatment or put all over the face for complete coverage. 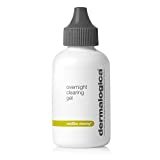 According to most documentation provided by Dermalogica this product works best as a targeted spot treatment that eliminates oils, dirt, and other gunk from within the pores. It is supposed to significantly reduce the chances of future acne breakouts for most acne types including cystic and hormonal. Alternatives ARE listed below, though. Thinking about buying this acne treatment product? Hold on just a second! Before you whip out your credit card and order a bottle there’s something important you need to do – check the ingredients. Why is this important? Well, you wouldn’t want to put something on your face that you may be allergic to, right? That’s why it’s crucial that you read over the ingredients list of any cosmetic you plan to use prior to buying it. Dermalogica recommends using this product once every night before bed for best results. I have eczema and psoriasis and this is the only acne gel/medication that hasn’t made my skin itchy or has an allergic reaction. I put it on at night and it keeps my acne in check. It does not 100% eradicate it but it gets very close when used everyday. Only thing is you have to wash it off in the morning because it is like a coating on your face. It seemed expensive but one bottle lasts me at least 2 months when used once per day, sometimes close to 3 months. hile it didn’t drastically improve my acne (which is mild, anyway), I do love the way it makes my skin look. If I put it on at night, in the morning my skin is noticeably brighter, such that I’ll happily skip my foundation that day. Application of the Overnight Clearing Gel is quite simple. After you’ve thoroughly washed your face and are getting ready for bed, just apply a thin layer of the gel all over your face or on the problematic areas. Once you wake up in the morning use a cleanser to thoroughly wash the solution off. Whether you’re fighting a battle against acne or just trying to have the clearest, brightest, most youthful skin you can – there are other products you may want to consider using either in lieu of Dermalogica’s Clearing Gel, or in conjunction with it. These are among our highest-rated reviews here on The Derm Report. These products have proven to be winners both by our team and by consumers. Be sure to check them out and add a couple to your daily beauty regimen. Obviously, though, like most other products, results vary greatly from person to person. Most people seem to agree that the product definitely makes a huge difference in the reduction of acne, though.